MB Where did the idea and inspiration for Deorbit come from? TM I had a variety of materials, lots of images of nature, trees and water, and Lucas [van der Velden] had numerous photographs downloaded from the European Space Agency (ESA) website. The basic material therefore seemed to be quite different. Telcosystems usually generates images and sounds from their own systems, and I thought that putting my images of nature ‘into’ these systems might produce something interesting. That was the starting point. Once we began editing we realised our material was actually quite similar and we very naturally found a theme. We tried to envision the perspective of a comet speeding through space and passing the Earth – travelling from afar, never orbiting our planet, and continuing on to new places or another cosmos. LvdV There’s also a connection to the dark universe. We immersed ourselves quite deeply in researching that area during the past year. I started looking into machine-made pictures of the Earth, planets and asteroids, and found many similarities to the computer-generated images we’ve been making for the past ten years. The ESA and NASA image archives are publicly accessible online. It’s an almost endless stream of images because the machines are set to record forever. We wanted to make sense of those ‘infinite’ databases, so we built systems that sorted these torrents of pictures based on their density or complexity. MB And then it all came together in a story of the fall of Icarus? GK When we discussed technical solutions to the Vertical Cinema project, we thought it would be interesting to investigate the transition from the analogue to the digital world, from different resolutions, 4K or 2K to very rough pixelated material, from virtual to very physical, and how to make a transition between these different states or phases. LvdV The Vertical Cinema project is also an invitation to examine the history of formats and carriers, so we used super low-res materials and super hi-res materials and fused them into a very complex, layered environment. It was interesting to experiment with all these different approaches and media to discover how they could be brought together. MB You worked with many formats and images, but all in the digital domain. Does the final result on celluloid differ from your expectations? TM I’ve worked with video and film for ten years now so I could imagine what would happen when we printed it to film. I really care about RGB brightness levels. At any given time, the film consists of at least 20 different layers of video. This means you have to be very careful with brightness levels. If there are too many layers and you go beyond a certain point of brightness it won’t work anymore because there’s no information beyond that brightest point. This is very important when it comes to printing on celluloid. It can express very subtle layers of an image. Lucas made lots of ‘noise images’ and we manually set the level of each image, so we did think about the final look of the film. GK This is very different from our previous film, Loudthings, the only film we’ve made on 35 mm. It requires an enormous amount of knowledge to convert digital files to celluloid. A lot of energy went into it, and an extra round of colour checking and correction was done in Austria. The results of the printing are fantastic. I was surprised at how Loudthings looked – so very different from what I’d seen while making it in the studio. But with Deorbit I was surprised by how similar it was to what we’d seen on our computers. There was hardly any difference at all. Of course, there are issues such as the warmth of the film and the phenomenal 10-metre tall projection – seeing your film projected in such a monumental size is truly overwhelming. I was really happy with how well it translated from one medium to another. LvdV What really helped was Makino’s knowledge on how you scale video to survive well on celluloid. We made a very noisy, dense and complex image, stemming from very many different carriers, some analogue some digital. No single source could be regarded as the original. So Makino’s skills were crucial. GK Also, in film projection you have a shutter, moving parts, 24 frames, but with digital projection you work in Hertz, and there are no moving parts. I think it is mostly to do with rhythm. Our film is perfectly suited to the motion of film, let’s say. LvdV I’ve seen large digital projections, and large data and video projections, and flow is very hard to create and even harder to maintain on a large scale. You never really notice the flow on a small monitor, but as soon as you scale up, the monumental size enhances the flow in the film. A project like this is also quite difficult to do digitally. Nobody allows you to play with those very expensive digital projectors because they are so sensitive. Analogue projectors have a wonderful robustness to them – simply lay one on its side and see what happens. LvdV I really enjoyed thinking about the image in a completely different way to how we usually work, namely creating them from a hard disk full of source material, which is the opposite of writing a computer programme that produces a hard disk full of images. We had to rethink the way we create visual complexity, motion, and all the parameters we usually design with our software. We couldn’t ignore the source material. For me that was a very playful way of making new images. GK The massive volume of images forced us to look at it as a collection of data, which made it abstract immediately. These images are a part of a digital ecosystem. You can say they come from outside a computer, but machines make all these images in an entirely digital process. There’s a lens floating somewhere in space attached to a little device that transmits images to Earth as ones and zeroes. There’s no human involvement in taking, sending or storing those images. It’s all part of a digital computer network in which information flows. We just tapped into a different data-stream. The danger lies in crossing into the field of aesthetic information design, something we want to avoid. Our films are not about databases or pattern recognition – they are abstract films that shouldn’t be technical or about technology at all. They should somehow stay very human. So in our previous films we explored the worlds inside our computers here in the studio, and now we’ve explore the world of machines connected to computer systems. LvdV The interesting thing about these recordings is that no one sees the images before they’re stored in the database. It’s just a satellite floating around taking pictures, streaming them home with all kinds of errors or artefacts that a cameraman would normally correct. They have an uncorrected, non-human quality. It is a purely mechanical approach. There’s no reason to it, nor is there a script. This is the most interesting aspect of working with machines. You can inject a lot of meaning into what you do with machines, but in essence they’re great at performing tedious or mind-numbing tasks. Machines don’t care about what they do – they’re here to work, nothing more. It’s a quality I see in observatory space missions: epic yet somehow meaningless at the same time: ‘Let’s just see what is out there.’ I like this aspect a lot and I see parallels with the way we work, except we do it on a much smaller scale. And this is probably what we share with Makino: exploring unknown territories, be they inside a machine or an actual recording. But they always have an utter strangeness to them. TM When I saw Telcosystems’ film Vexed at the Rotterdam Film Festival in 2012, I realised that some parts were quite similar to my work. And Telcosystems don’t use cameras at all yet I work with them exclusively. Their work contains very organic movements and I wondered what a collaboration would produce. I’m really interested in the tiny abstract movements, but I hadn’t generated noise images with a computer before this project, because I’m sure that I can make similarly complex visuals from images of nature. Sometimes these are really complex, far more than I can anticipate. I can’t imagine the shape of a forest or how a body of water will reflect the surroundings. Nature is chaotic and full of chaotic motion, and it has surprised me many times. I try to capture and control this in my films. My final images are sometimes very similar to snow noise. Telco’s approach is different, but the end results can be very similar. MB Did you record the film live or was it edited? GK Contrary to our previous film, Vexed, this one is edited, either by machines or by Makino in Final Cut or by me in After Effects. We also had a special effects department for this film – that was Lucas – where we created real-time special effects with the edited material. The output of the special effects machine was recorded live and used in the editing process again. LvdV We used segments of Makino’s footage to make the real-time sequences. And we made several little programmes that did simple tasks with the still images from ESA and NASA: sorting, creating movement, stepping through images, and so on. So it wasn’t just one way of editing, but many different types. GK Our colleague Martijn [van Boven] called this process of making a film from a huge collection of still images ‘data wrangling’, after the wranglers who tend and corral large herds of cattle. Not only was there this huge archive of downloaded photographs, but these images were also in very high resolution, making some of them enormous files. We had to make small subsections of them that were reformatted to a workable resolution and size, sometimes making an even lower resolution that we sequenced. We made numerous software tools that cut larger images into smaller ones and then sorted them so that another computer could understand what to do with them. That all happened in real time. Our little software labourers worked on some computers while we edited on others. MB How and when did you decide that you wanted to have drums in the soundtrack? TM My favourite film soundtrack is to Free Radicals [Len Lye], and it mainly consists of drumming. Our images change very slowly, a bit like a visual drone. An electronic drone soundtrack wouldn’t be interesting, as it would mirror the visuals. I felt a beat while I was editing, and the audience would also be taken by surprise because nobody expects drumming in a film like this. LvdV I only ‘heard’ industrial machine sounds while making the images, so at first I thought drumming was a rather strange idea. But when I listened to the first take it immediately made sense. It draws the imagery back into the human domain. It reminded me of the fact that humans have always made music to appease or celebrate nature. We know that cavemen played music for the trees, stars, sun, rain and so on. So for me this soundtrack resembles some sort of tribute to the cosmos. GK Balázs Pándi played the drums. I didn’t give him many instructions. He took the film and recorded three takes. We used the first one. It was absolutely spot-on. He basically improvised live to the film. Lucas and Makino also made lots of layers of other sounds. I processed the drums heavily to destroy them a bit and then we put it all together. The film is a true blend of all these worlds and everybody’s input, but the drums are instantly recognisable. MB How did the vertical aspect influence your process? GK We began by turning all the monitors in the studio on their sides to look at everything we made in the vertical. We’d already done a lot of work on the technical side of the Vertical Cinema project, so we’d talked about it a lot: how to make and build a projector, how to print a digital file to film, how to design the workflow, etc. From there we went to the studio. Because we didn’t use cameras, nobody had to lay down on their sides nor was there any architecture that had to be filmed in a particular way. This project was very different because verticality forms the core of the film. LvdV Our images generally suggest the feeling of floating in space, there’s no up or down, no horizon. So we find this notion of the horizontal in film very strange. Tina Frank said something similar. You have a canvas, and you design for it no matter if it is horizontal or vertical. This is very normal in the design world, but not so much in the film world. I believe this project worked out so well and the films are so good because of the vertical format and because everyone had to work in a new and challenging way. GK Apart from Vexed, all of the works we’ve made over the past few years have been for vertical screens, for instance Thrift and 12_series. So we’re a bit used to thinking vertically by now. TM In normal cinema you look down towards the screen, but with vertical cinema you look up. I thought that if we’re going to make a vertical film it should have a truly cosmic image. A vertical screen is like a window: if I make a scratch on the vertical image it will resemble rain on a window. But if that image moves very quickly it will look like a waterfall. 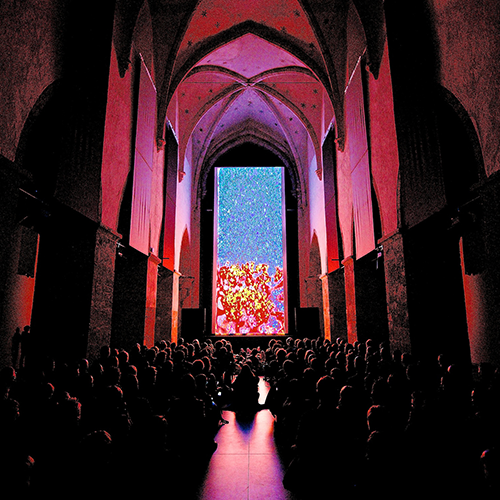 I think human beings are used to seeing vertically: tall trees, the stars, waterfalls… The first screening was scheduled for the Minoritenkirche in Krems and its dome is decorated with lots of stars. So from the beginning I had images of stars and the cosmos on my mind. MB What are your thoughts about the Vertical Cinema programme? GK I probably don’t have enough critical distance, but I think it’s a great programme. I was very happy that all the films are of such a high standard. We selected the filmmakers carefully in the hope that this would happen. We had an incredibly small crew to produce it all, with limited time and money. Some people we talked to, especially from the film world, questioned the reasons behind the project – why vertical, why do it the hard way and not just digitally? Some of them even said that it was impossible. I think this project shows that the hard way is the only way. It is incredible how everyone in the project – the production crew, labs, people who funded the project – all gave 200 per cent of themselves. That doesn’t happen very often. We usually do more commissioned work, organise festivals, and we invite a lot of people to work with us, but I think from the personal and production point of view this has been one of the smoothest and most rewarding productions if you compare the input to the output. LvdV I think the Vertical Cinema project demonstrates that so much is possible right now. If you really want something, you can get it done. It also shows the importance of doing things differently. This is a collaborative effort from people who – in their naivety and curiosity – thought it was a good idea to change the screen format and see what happens. But one of the most interesting things is that this project uses the latest digital developments alongside the most basic handmade techniques. This programme shows the richness of the world in which we live. TM I agree completely. I quit my job because this project is so interesting. [Laughs] I think the years 2012 and 2013 will be a turning point in the history of cinema. At first I thought the idea of printing on celluloid – in 2013! – was crazy. We tried entirely new things and that’s what counts nowadays. Not many people are capable of realising a project like this so perfectly. It will have a resounding impact on the cinematic culture.